The methods of embalming, or treating the dead body, that the ancient Egyptians used is called mummification. Using special processes, the Egyptians removed all moisture from the body, leaving only a dried form that would not easily decay. It was important in their religion to preserve the dead body in as life-like a manner as possible. So successful were they that today we can view the mummified body of an Egyptian and have a good idea of what he or she looked like in life, 3000 years ago. Mummification was practiced throughout most of early Egyptian history. The earliest mummies from prehistoric times probably were accidental. By chance, dry sand and air (since Egypt has almost no measurable rainfall) preserved some bodies buried in shallow pits dug into the sand. About 2600 B.C., during the Fourth and Fifth Dynasties, Egyptians probably began to mummify the dead intentionally. The practice continued and developed for well over 2,000 years, into the Roman Period (ca. 30 B.C.–A.D. 364). Within any one period the quality of the mummification varied, depending on the price paid for it. The best prepared and preserved mummies are from the Eighteenth through the Twentieth Dynasties of the New Kingdom (ca. 1570–1075 B.C.) and include those of Tutankhamen and other well-known pharaohs. It is the general process of this period that shall be described here. The mummification process took seventy days. Special priests worked as embalmers, treating and wrapping the body. Beyond knowing the correct rituals and prayers to be performed at various stages, the priests also needed a detailed knowledge of human anatomy. The first step in the process was the removal of all internal parts that might decay rapidly. The brain was removed by carefully inserting special hooked instruments up through the nostrils in order to pull out bits of brain tissue. It was a delicate operation, one which could easily disfigure the face. The embalmers then removed the organs of the abdomen and chest through a cut usually made on the left side of the abdomen. They left only the heart in place, believing it to be the center of a person's being and intelligence. The other organs were preserved separately, with the stomach, liver, lungs, and intestines placed in special boxes or jars today called canopic jars. These were buried with the mummy. In later mummies, the organs were treated, wrapped, and replaced within the body. Even so, unused canopic jars continued to be part of the burial ritual. The embalmers next removed all moisture from the body. This they did by covering the body with natron, a type of salt which has great drying properties, and by placing additional natron packets inside the body. When the body had dried out completely, embalmers removed the internal packets and lightly washed the natron off the body. The result was a very dried-out but recognizable human form. To make the mummy seem even more life-like, sunken areas of the body were filled out with linen and other materials and false eyes were added. Next the wrapping began. Each mummy needed hundreds of yards of linen. The priests carefully wound the long strips of linen around the body, sometimes even wrapping each finger and toe separately before wrapping the entire hand or foot. In order to protect the dead from mishap, amulets were placed among the wrappings and prayers and magical words written on some of the linen strips. Often the priests placed a mask of the person's face between the layers of head bandages. At several stages the form was coated with warm resin and the wrapping resumed once again. At last the priests wrapped the final cloth or shroud in place and secured it with linen strips. The mummy was complete. The priests preparing the mummy were not the only ones busy during this time. Although the tomb preparation usually had begun long before the person's actual death, now there was a deadline, and craftsmen, workers, and artists worked quickly. There was much to be placed in the tomb that a person would need in the Afterlife. Furniture and statuettes were readied; wall paintings of religious or daily scenes were prepared; and lists of food or prayers finished. Through a magical process, these models, pictures, and lists would become the real thing when needed in the Afterlife. Everything was now ready for the funeral. As part of the funeral, priests performed special religious rites at the tomb's entrance. The most important part of the ceremony was called the "Opening of the Mouth". A priest touched various parts of the mummy with a special instrument to "open" those parts of the body to the senses enjoyed in life and needed in the Afterlife. By touching the instrument to the mouth, the dead person could now speak and eat. He was now ready for his journey to the Afterlife. The mummy was placed in his coffin, or coffins, in the burial chamber and the entrance sealed up. Such elaborate burial practices might suggest that the Egyptians were preoccupied with thoughts of death. On the contrary, they began early to make plans for their death because of their great love of life. They could think of no life better than the present, and they wanted to be sure it would continue after death. But why preserve the body? The Egyptians believed that the mummified body was the home for this soul or spirit. If the body was destroyed, the spirit might be lost. The idea of "spirit" was complex involving really three spirits: the ka, ba, and akh. The ka, a "double" of the person, would remain in the tomb and needed the offerings and objects there. The ba, or "soul", was free to fly out of the tomb and return to it. And it was the akh, perhaps translated as "spirit", which had to travel through the Underworld to the Final Judgment and entrance to the Afterlife. To the Egyptian, all three were essential. After death, the pharaohs of Egypt usually were mummified and buried in elaborate tombs. Members of the nobility and officials also often received the same treatment, and occasionally, common people. However, the process was an expensive one, beyond the means of many. For religious reasons, some animals were also mummified. The sacred bulls from the early dynasties had their own cemetery at Sakkara. Baboons, cats, birds, and crocodiles, which also had great religious significance, were sometimes mummified, especially in the later dynasties. 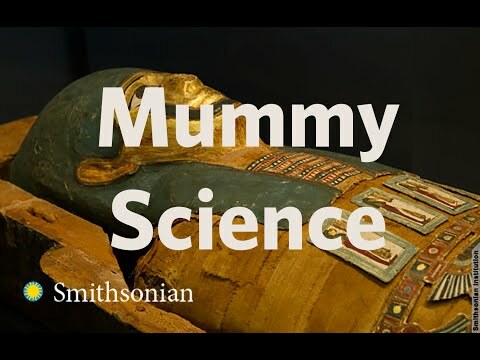 Ancient writers, modern scientists, and the mummies themselves all help us better understand the Egyptian mummification process and the culture in which it existed. Much of what we know about the actual process is based on the writings of early historians such as Herodotus who carefully recorded the process during his travels to Egypt around 450 B.C. Present-day archaeologists and other specialists are adding to this knowledge. The development of x-rays now makes it possible to x-ray mummies without destroying the elaborate outer wrappings. By studying the x-rays or performing autopsies on unwrapped bodies, experts are learning more about diseases suffered by the Egyptians and their medical treatment. A better idea of average height and life span comes from studying the bones. By learning their age at death, the order and dates of the Egyptian kings becomes a little clearer. Even ties of kinship in the royal line can be suggested by the striking similarities or dissimilarities in the skulls of pharaohs that followed one another. Dead now for thousands of years, the mummy continues to speak to us.